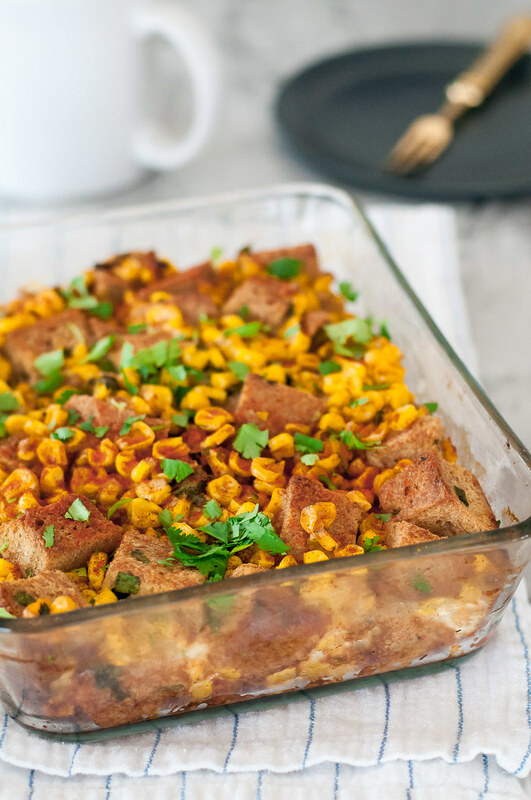 Know what’s more exciting than describing every tender, fresh bite of this simple Southwest breakfast strata for three paragraphs (besides eating it)? The belated Christmas surprise that Steve and I are picking up tomorrow evening, assuming our flight departs on time from the snowy tundra that is currently Oklahoma City. So first, overnight Southwest breakfast casserole. But, more importantly, this face. His name is Clarence, as it has been since we agreed that a pug was in our future a couple years ago. It’s taken a while, waiting to move out of the rental that didn’t allow pups, and then figuring out that a pug from a breeder could take ages to come by. 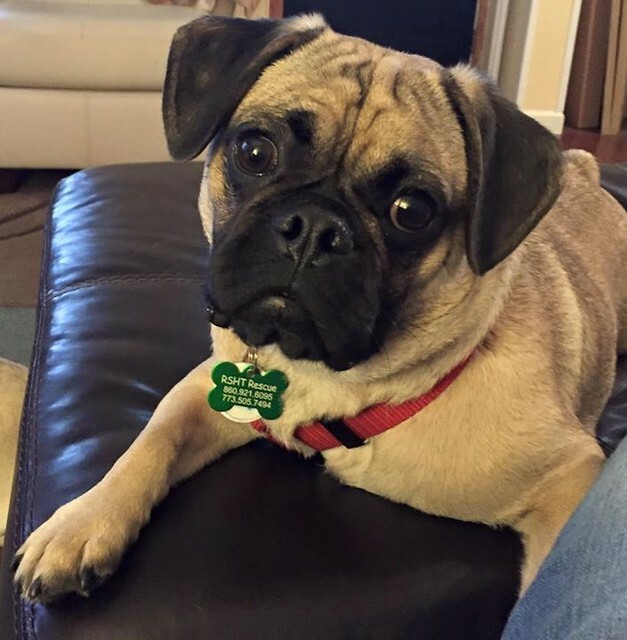 Jurgen the Pennsylvanian pug breeder never really followed up with our inquiries, but Steve was worried that starting with a rescue could result in a shorter life span for our new fur baby, which would be especially hard on me when it came time to say goodbye to my first dog ever. I’m not sure how, but I convinced Steve and myself that adopting a rescue would not only be quicker, but that it was the right thing to do. Before I knew it, Anya was texting me pictures of potentials, and we said yes to our eight-month-old rescue from Chicago! Today will be spent in anticipation, savoring our last 24 hours in Oklahoma with my family and researching pug diets. 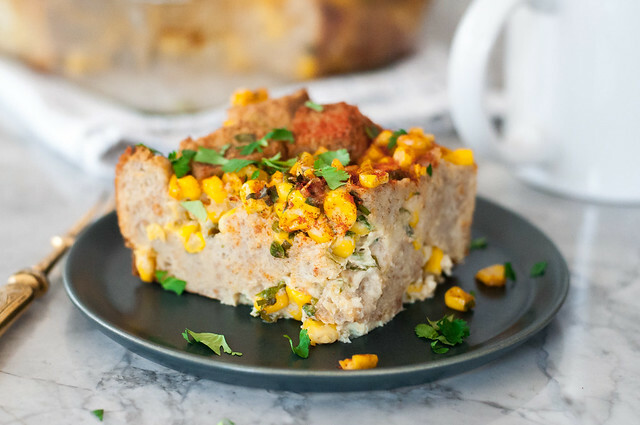 I’m going to do my very best to resist those puppy eyes as Clarence begs for a bite of whatever I might be cooking, like the bread cubes or some cheese as I quickly assemble yet another breakfast bake, this time simple Southwest breakfast strata. It’s the same concept as the holiday overnight Italian version, but with a 180 in the flavor department. It just depends on what you’re craving next weekend: robust, rich tomato sauce and mushrooms or light and fresh corn, scallions, and cilantro? 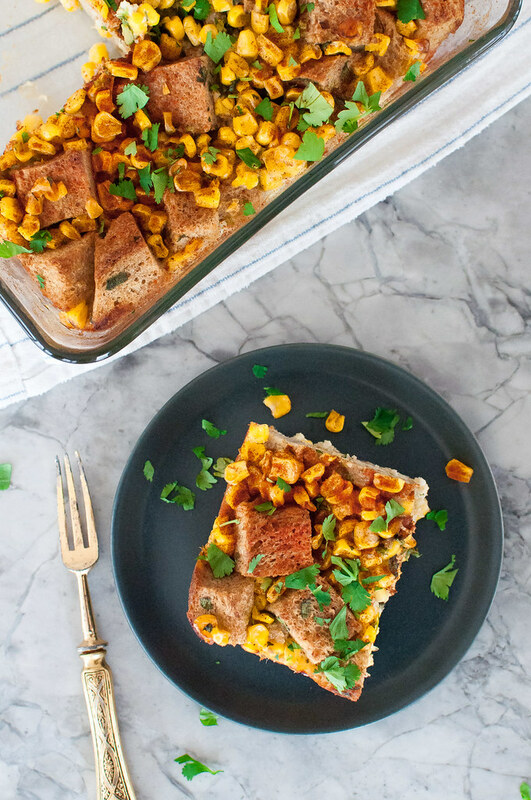 I’ll admit that this Southwest breakfast strata is the quicker of the two options. Scallions and frozen corn get a quick sauté before tossing them with bread, milk, cheese, eggs, and some herbs and spices. If you’re dedicated to your brunch game, you know the drill from there: refrigerate overnight, turn on oven in the morning, and let the house fill with all the smells. Not the kind that will make you nauseous after a night out, but rather those scallions getting soft and flavoring the bread cake of sorts that you’re about to serve. My new kitchen is treating my well, but I have to sympathize with Melissa on learning a whole new lighting setup. I can’t remember where on her site I read about it, or maybe it was Lindsay who relayed the message at the Tasty Food Photography workshop. Regardless, learning new light (while still learning photography! ), testing recipes, unpacking boxes, and thinking about how the heck I can decorate this house on a reasonable budget causes some lapses in common sense. For instance, immediately after this photo shoot, I fixed myself a piece of strata for lunch, piling it high with sour cream, TJ’s salsa verde (yes, I buy pre-made salsa all winter), and pickled red onions. It looked so glorious! Sour cream drips! Bright pink onions! Why did I not think of that 30 minutes before when setting up for the photo shoot? But, we had to leave for Dallas the next day, and I still had to pack my bags and test one more recipe, so it was a time for going with the flow. 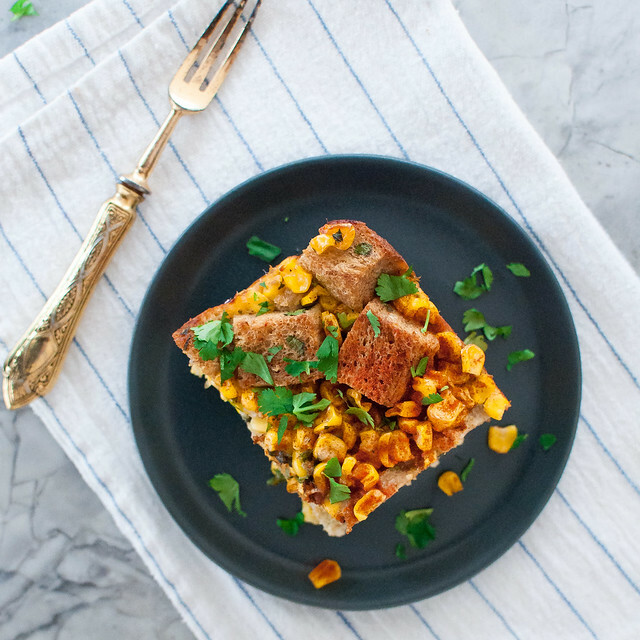 All I ask is that you use your imagination when envisioning how over the top you might take this Southwest strata for your next brunch, “frosting” each slice with cool, tangy sour cream. And that you comment below with every tip and trick you have for a first time puppy owner! 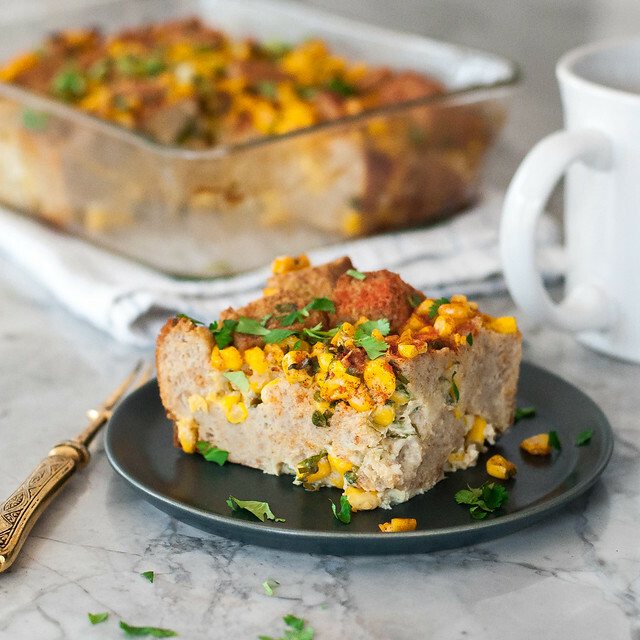 Basic breakfast casserole--a base of bread, eggs, milk, and cheese--gets loaded up with corn and more Southwest favorites for a bright, crowd-pleasing brunch entrée. Make it the night before for maximum efficiency. Grease a 2.5 quart or larger baking dish with butter or cooking spray. 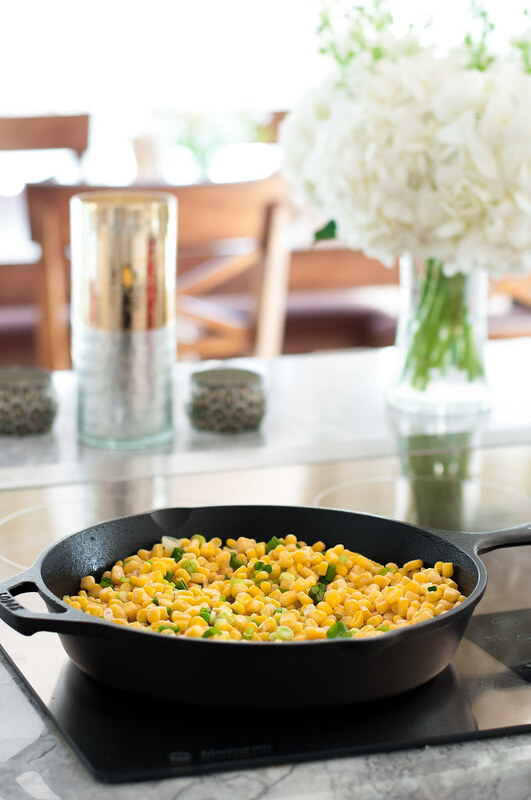 Melt 1 tablespoon butter in a medium skillet over medium high, then add scallions and corn. Cook until scallions are softened and corn is thawed and warm, around 5 minutes, stirring occasionally. Off heat, stir in paprika, chile powder, ½ teaspoon salt, cilantro, and basil. Whisk eggs, milk, and ½ teaspoon salt in a liquid measuring cup or mixing bowl. 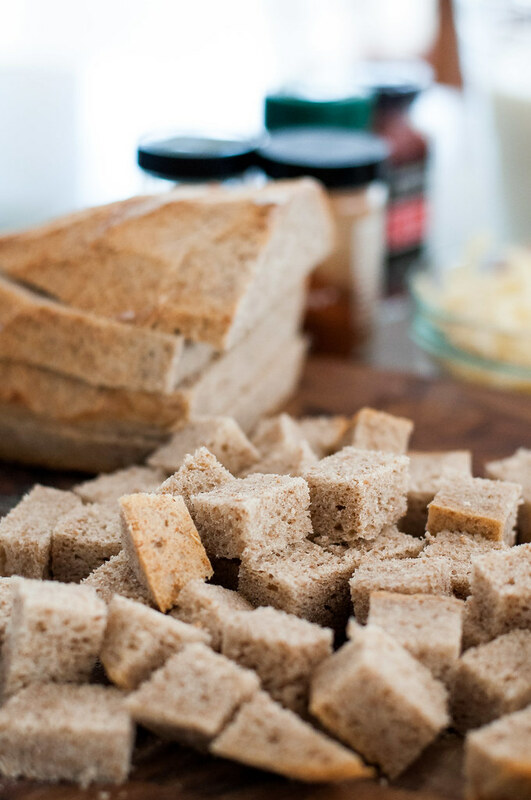 Place bread cubes in a large mixing bowl, pour egg mixture over it, add corn mixture and cheese, and mix it all together. Using your hands to mix works best. Spread evenly in the baking dish, cover, and refrigerate at least a few hours, or overnight. To bake, remove from refrigerator for an hour, then preheat oven to 375 (F). Bake uncovered until set and beginning to brown, 45 to 55 minutes. Garnish with additional paprika and cilantro. Serve with sour cream, salsa, and pickled red onions. To make it meaty, mix in crumbled, cooked breakfast sausage. My sister tested this variation on her husband and it came out great!